Weeki Wachee Springs is about 12 miles southwest of Brooksville at the head of the Weeki Wachee River. It is just south of State Hwy 50 on the west side of U.S. Hwy 19. This is a well known landmark and will be very easy to find. Look for the swimming mermaid signs all over the interstate and state highways. The spring pool is about 150 feet wide and 250 feet long with the walls of the spring vent deeply cut by the turbulent discharging water. This is a first magnitude spring well known for it's swimming mermaid shows, underwater theatre, and summer water park. The flow is so strong that even the most experienced divers have become nearly helplessly key holed. There are several spots around 100 where the water flows up a wedge with the discharge being too tight to pass through. If a diver were to become caught here, they would not have the strength to pull themselves out. Deco would be horrendous since the only protected spot is rock at 120 until you can get out of the flow around 60. 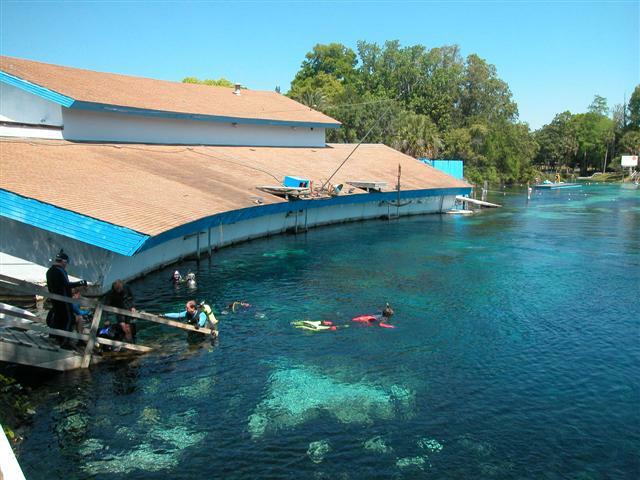 Weeki Wachee Springs theme park was open for recreational divers for 2 years with Neptune Divers operating the tours at the park. Opening weekend was September 25, 1999. Cave and cavern diving were not allowed for obvious reasons. The management of Weeki Wachee Springs decided not to renew the Neptune Diver's contract allowing them to run the diving operations. This site was closed to diving on August 31, 2001. It was a great place to do OW check-out dives as it allowed friends and family to watch from the theater. I think the park saw how great the operation went and will want to open it up themselves to cut out the people that did all the legwork. It is too bad since just a month before it closed the local drought put to flow to manageable conditions for attempts at diving the cave. After a class, I did a few drops to around 150 and could see the system just kept on going. The window probably won't open again for another few years. Manatees do visit the springs during the winter period, so the river access isn't completely fenced. The management of the park is fairly buddy-buddy with the local sheriff's department, so use the information at your own peril. To dive it you would have to wait until the area is so dry that you could get to Eagle's Nest with a Yugo on bald tires. If anyone made a map of the basin area (such as for a DM class), then I would really like to get a copy for my collection and to post that as well. 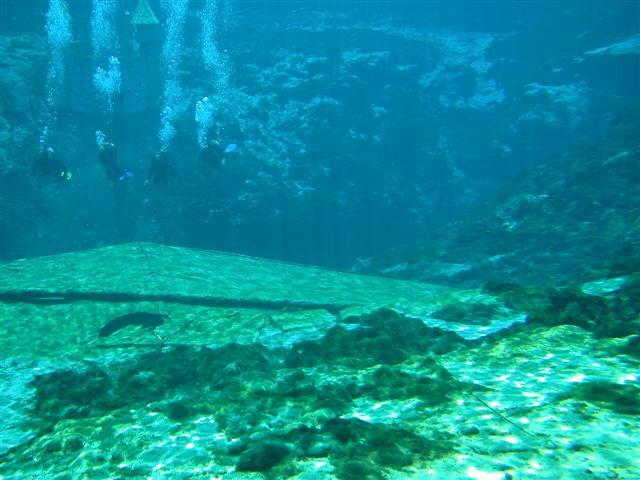 Weeki Wachee is now operating their own SCUBA access. In order to dive here, you must be a part of an organized group associated with a dive shop. The average cost charged by shops to dive the site is $40-45, so it isn't a cheap site, but definitely worth a trip. Once inside, you are free to enjoy the rest of the park including the shows and water slides. Observers are welcome at the general admission price and can watch you from the underwater theater, however they may not swim in the spring without signing the required forms and paying the guide fees. Last time I was there I spotted a dive reel sitting on the rock around $150, but could not get past the rock at 120. The only way to conceivably get down would be to take off your fins and get as heavy as possible. The would be the only good place that Heiser tanks would be useful. If you use a drysuit or even fins, you are begging for a nasty ascent and potentially dangerous wedging.